Meticulous by nature and precise by training, Jonathan Benno earned unparalleled experience working in the nation’s finest kitchens: as Chef de Cuisine at Per Se, Sous Chef at Craft, and Sous Chef at The French Laundry. With the highest respect for regional integrity and seasonality, Benno sources only the finest ingredients (local whenever possible) for his Lincoln Ristorante and prepares them with authenticity and technique. 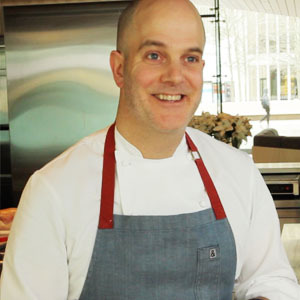 Benno was a semifinalist for the James Beard Award for Best Chef: New York in 2014. His Lincoln Ristorante received a Michelin star in 2013, and was named the “Best New Restaurant In America” by GQ and one of the “Best New Restaurants” by Esquire, both in 2011. "The basics are a steel, a chef's knife, a slicer, and a paring knife." Reginette verde is fun and a perfect vehicle for a ragú. "A very traditional meat sauce from Bologna."